Joint Bike Ride - JA Awareness By Tandem! 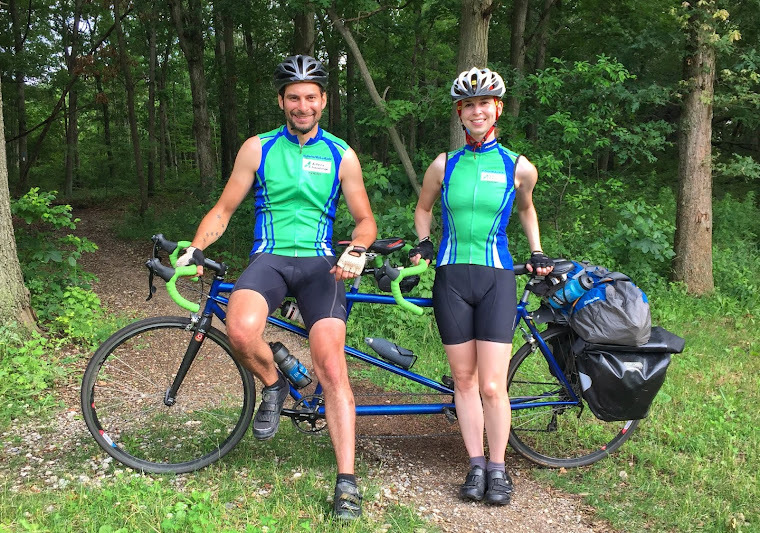 Follow our journey from NYC to FL as we ride to the Juvenile Arthritis Conference in Orlando, FL in an effort to raise awareness for the disease. Follow us on Twitter @JointBikeRide and on Twitter/Facebook/Instagram using #NYC2FL DONATE: www.ya.kintera.org/jointbikeride Donations go straight to the Arthritis Foundation! Day 21: Let the JA Conference begin! Today marked the beginning of the 2015 JA Conference, the reason why we biked down to Florida during July (we didn't pick the location or time of year people!). The first official event of the day was our Welcome Party to help bring us in in style. Of course, we were actually already here, and we didn't want to just walk out of the hotel with our bike, so we went to go get breakfast at Cracker Barrel and then came back to make our grand entrance. We were killing time, because everyone said that we should ride in at 11:30. But then of course, they wanted us early because people were standing around. I can imagine that wasn't pleasant, we know how hot it was! So we headed back for our big entrance, and we worked up a sweat in just that short ride! But we made it, and I got chills as I saw a crowd assembled for us to ride into. It was so fantastic. I'm glad I wasn't steering because I probably would have crashed us, I got shaky as we came in, just filled with emotion. Photo with helmets at first, but then they said to take it off because of the shadows on my face--I cherished those shadows and my visor on the ride, glad it was doing its thing! They then even had a cake for us, it was amazing! It was gluten free and decorated so sweetly a map of our ride and even little helmets...that matched OUR helmets!!! We had an overwhelming response from people all day. I LOVED that people came to say hi and share their stories with me or what the ride meant to them. Anywhere from inspiring them to get out their bike to helping make infusions go faster by checking our updates, they are truly we we did this ride, this is about all of us, and I'm so happy to get to see the other pieces of the mosaic that this journey assembled. Here are just a few shots I got with friends and supporters today. And with that, I need to finish my presentation for tomorrow (come to my session on physical activity and JA at 3:45!) and sleeeep. Everyone asks how can I still have energy, well, I get a high from the conference, but it's going to be a tiring few days! The best kind of tiring though! Sitting here thinking about writing this post is overwhelming. I know I can't possibly say all I want to here, and frankly, I don't have time! Because no rest for the weary, it's time to snap into conference mode! But I need to at least recap the day, and then get all sentimental and mushy at another time, cool? Ok, let's do this. We woke up pretty tired, but knew we just had to rally for one more day. We aimed to leave at 6:30am, so you know how that went. Jen got up with us to see us off. She packed us a bag of snacks, which was totally unnecessary, because we skipped breakfast there. We loaded our bike for the final time and hit the road around 7:15. And with that, our final 100 miles was underway! We then road through lots of beach cities, one after the next. Some looked sweet and relaxing, some looked touristy and like it would be full of drunk beach goers. We are glad we didn't end up in any of those places. Having skipped breakfast, we decided we needed to stop to eat. Along the coast, most of the places seemed like diners, which we were kind of over. So I yelped a place (surprise!) that was in Daytona Beach, just where we would be turning in from the coast. So we said goodbye to the beach and headed inland! As we turned to head inland, we were faced with a giant bridge, that I immediately did not want to do. Keegan made fun of my reaction. I watch the map, and knew there were other bridges across, maybe the others weren't so steep (it's true, we could see a flat one in the distance), but we did it. My reaction against the bridge stemmed from my knee hurting. I didn't want to push it much more. But, I did push it, and I survived. Crazy car we saw covered in stickers and figurines. We then stopped for breakfast at a place called Dancing Avocado kitchen. It had fresh juice and not greasy diner food. We sat down for a few minutes, and then I heard someone say they wanted to come see the Arthritis Riders...I looked back and was shocked, an old friend, Susie, and her fiance David, had followed our GPS signal and knew where we stopped and came to meet us! Susie had just moved to the area last week, but had been following along our journey and surprised us with a visit! It was so fun! Way better than diner food! Susie knew where we were...had to disguise. Shot before we left breakfast and continued on! We had 80 miles more to go. On our way out of town we passed by the Daytona Speedway--pssh, we are way faster than them! Google directions were actually pretty good today, some nice back roads to break up being on the major roads. We even ended up chasing some poor egrets and blue herons that probably don't see too many bicycles! We were kind of in the middle of nowhere, but we had just found a gas station to stop and fill water bottles with what turned out to be absolutely disgusting water. And that's when it happened--we ran out of sunscreen! AAAAHHH!!! They had some little tubes that I bought, 2 tiny tubes for $9. Can you believe it! Sheesh, well, we got one more coat and would stop at the next pharmacy we found. Then, it started to pour. And I mean POUR. At first it was a few hard drops, then the sky opened. We quickly pulled over to put the trash bag on our duffle that was not as waterproof as it had advertised. I put the cover on my waterproof cellphone case and we continued on. There was no shelter for us to hide under anyways. And turns out, it just lasted forever. We kept trying to outrun it, but we couldn't. We wanted to sit outside because it was too cold inside with the AC, so we moved our bike under the awning in case it started to rain again. 1400 mile mark high five!!! We were soaked from the rain and both changed socks into dry ones. Good thing, we were turning pruney!! Still no sun to speak of, and actually as we put on sunscreen a little girl and her mom walked by and the girl asked, "Mommy, why are they putting on sunscreen?" Because the UV are everywhere, little girl!!! We then continued on our merry way, excited for the last 30 miles of our trip (yes, we biked OVER 1400 miles!). We were on a pretty great bike path for awhile, Google redeemed itself, finally. It was the Seminole Wekiva Trail, and it even had a cool project called Paint The Trail that was very entertaining to ride by. The trail finally ended and we were back on the road. It was about an hour out from our arrival, and although we had raised almost $4,000 in just a couple days, we were still $515 short of our $14,000 goal. That morning we started with around $12,000, but we knew we could do it! So we stopped to take shelter from the rain (oh yeah, it was raining again) and to do some final fundraising pushes on social media (sorry to all who were bombarded with it!). But, it worked. Not too much farther down the road after several more notifications came through--I refreshed the page and saw we had done it: $14,010! Wooooo!!!! We were so pumped. At this point, we had met our mileage and fundraising goals, and were flying high into Orlando. We started playing the fabulous pump up songs that we had crowd sourced suggestions from. We were pumped! We stopped at a Welcome to Orlando sign, to document our success. We had made it! But just a little bit farther to the hotel (southern Orlando, for sure). And then, there it was. In all it's crazy pink glory--the Caribe Royale! I had updated folks our arrival, so we knew we had some friends waiting there for our big arrival! After our quick photo opp with the sign, we rolled in where some of my favorite AF staff and friends were waiting to cheer us in! Kate and Delaney Kuhns never disappoint with the welcome signs! With Katie and the birthday girl, Veronica! Katie didn't get the memo about the open mouth. And that was that! We then checked into the hotel, where originally they had given us a 4th floor room, to which I explained we had a giant bicycle and would be better off with a first floor room. They had lots of questions about the ride and were in total awe. Keegan and I immediately got to spreading out (he dumped everything on one of the beds) and I showered. He had his heart set on room service, so that's what we did. Ordered room service, sat in our pajamas, and watched TV. Total luxury. And that was that. We had done it, we rode over 1400 miles (total was 1430 miles) and raised over $14,000 (total when we pulled in was $14,080, already higher this morning). Again, I will speak of the magnitude of what this all meant to me at a later time, but for now, it's time to get off and running for the JA Conference! Day 18: Livin' up Fernandina!